The crown of King Christian V of Denmark was the crown used at the coronation of all of Denmark's absolutist kings. While the reign of such monarchs ended in 1840, the crown is still used during a Danish king's castrum doloris, the last time in 1972. Used by the kings from Christian V to Christian VIII. Made by Paul Kurtz in Copenhagen, 1670–1671. Gold with enamel and table-cut stones. Total weight 2080 g. Also 2 garnets and 2 sapphires, of which the largest dates back to Frederick I of Denmark. Frederik III had large parts of his daughters' trousseau bought in Paris, which, already at that time, was a centre for European fashion. But the jewellery was commissioned to Kurtz. He was, therefore, considered an outstanding jeweller. In 1670–1671 he made his principal piece of work, Crown of Christian V. The closed shape was inspired by the crown of Louis XIV of France, but Kurtz replaced the lily-shaped points of the French crown with palmettes and adorned the crown with a row of diamonds intertwined with palmette and acanthus. In that way a "white" play of light was created, which was framed by blue and red in the sapphires and garnets of the crown ring and the orb and cross in the top. 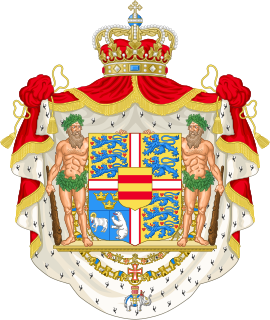 The crown forms part of the National Coat of arms of Denmark and the Royal Coat of arms. Since 1671, the crown has been the de facto symbol of the state power. It is included in stylized and varied forms in most state institutions, including ministries. Three Crowns is a national emblem of Sweden, present in the coat of arms of Sweden, and composed of three yellow or gilded coronets ordered two above and one below, placed on a blue background. Rosenborg Castle is a renaissance castle located in Copenhagen, Denmark. The castle was originally built as a country summerhouse in 1606 and is an example of Christian IV's many architectural projects. It was built in the Dutch Renaissance style, typical of Danish buildings during this period, and has been expanded several times, finally evolving into its present condition by the year 1624. Architects Bertel Lange and Hans van Steenwinckel the Younger are associated with the structural planning of the castle. Amalienborg is the home of the Danish royal family, and is located in Copenhagen, Denmark. It consists of four identical classical palace façades with rococo interiors around an octagonal courtyard ; in the centre of the square is a monumental equestrian statue of Amalienborg's founder, King Frederick V.
The coat of arms of Norway is a standing golden lion on a red background, bearing a golden crown and axe with silver blade. The coat of arms of Slovakia consists of a red (gules) shield, in early Gothic style, charged with a silver (argent) double cross standing on the middle peak of a dark blue mountain consisting of three peaks. Extremities of the cross are amplified, and its ends are concaved. The double cross is a symbol of its Christian faith and the hills represent three symbolic mountain ranges: Tatra, Fatra, and Matra. Rosenborg Castle Gardens is the oldest and most visited park in central Copenhagen, Denmark. Established in the early 17th century as the private gardens of King Christian IV's Rosenborg Castle, the park also contains several other historical buildings, including Rosenborg Barracks, home to the Royal Guards, as well as a high number of statues and monuments. The park also plays host to temporary art exhibitions and other events such as concerts throughout the summer. Paul Kurtz came to Denmark from Germany in 1655. He made silver and gold items for Frederik III and was mentioned in 1659 as "the King's goldsmith". Rosenborg Barracks, one of two barracks of the Royal Danish Life Guard, is located next to Rosenborg Castle in Copenhagen, Denmark. Its address is Gothersgade but it has a long facade along Øster Voldgade.